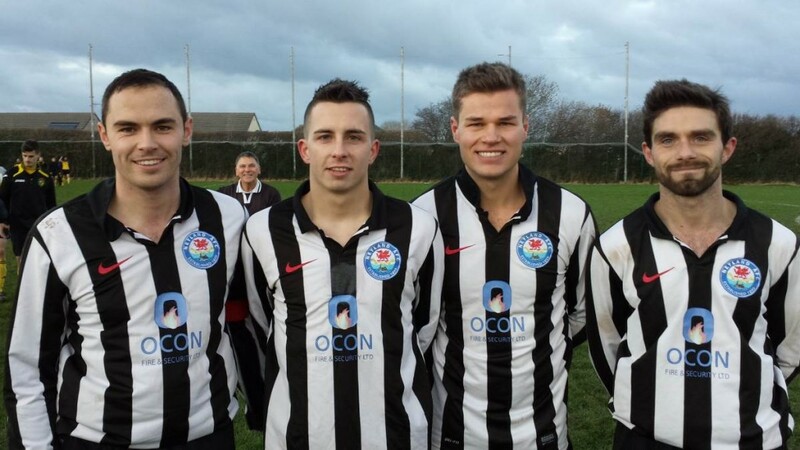 Left to right – are goal scorers Sean Hannon, Justin Harding, Henry Durrant and Nathan Warlow. After last week’s postponement due to adverse weather, the Nomads were pleased to get another fixture ‘under their belts’. The visitors to the Athletic Ground in the First Division Derby were Herbrandston. Conditions were far from ideal and it was clear from the outset that the pitch might suffer some irreparable damage – which may prove to be costly later in the season. However, although there was a blustery wind both sides were able to settle to some positive attacking football. Those who braved the elements had to wait for 25 minutes before the home side opened their account. An accurate cross from the left of the ground found skipper, Sean Hannon, joining the forwards in the visitor’s penalty box. He directed an accurate header which eluded the keeper to give the Nomads a 1-0 lead. Although several more chances came to the home side the score was unchanged at the break. During the first period of the second half, Herbie launched a few forward forays and looked as if they were likely to convert an equaliser. However the home side’s defence dealt effectively with these attacks and launched some counter-attacks of their own. After 15 minutes Nathan Warlow found himself in receipt of the ball on the edge of the box. He rounded one defender, saw a clear space to goal and struck an excellent shot which rocketed in to the top of the Herbie net. That was the ‘margin’ which gave the Nomads the confidence to really set up a series of attacks. After a further 15 minutes, Sean Hannon again went into ‘forward mode’ striding down the left flank and striking a fine shot/cross which Justin ‘Skinny’ Harding managed to get a toe to and netted for Neyland’s third. And with five minutes remaining, Henry Durrant went on a run down the centre of midfield, passed a defender before turning and rifling the ball into the top of the net from just outside the penalty box. The 4-0 victory takes the team up to 4th in the division. The 2nd X1 fixture at Pendine was postponed due to a waterlogged pitch. Next Saturday the 1st’s are home to Narberth. This entry was posted in Sports on November 23, 2015 by admin.